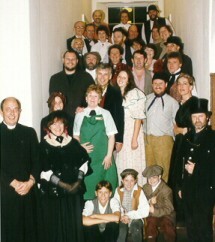 The photograph shows the original cast taken on the stairwell in Haslemere Museum. Created as a Community Play, and first performed in October 1995, this play script dramatises the events surrounding the creation of The National Trust in the context of local events which were happening at the same time in the area around Haslemere in south west Surrey. Suitable for schools and other societies interested in dramatising history. The story of Fifty Years in the history of Haslemere and Hindhead, during which time The National Trust is founded and Hindhead is ‘saved’. The action of the play takes place in various locations between the years 1855 and 1905, but begins at the present time in the ‘Happy Eater’ at Hindhead. The performance is continuous, with one interval of 15 minutes, to celebrate Queen Victoria’s Golden Jubilee. The present day, inside the Happy Eater, Hindhead. Three men enter for a coffee. In their imagination they are taken back to the 1850s. Haslemere High Street, after midnight of Saturday 28th July 1855. Insp. Donaldson & Constable Freestone of the Surrey Constabulary are on duty. Haslemere railway station, mid 1860s. Several characters now take advantage of the railway coming to Haslemere. A room in London, 1866. George Shaw Lefevre and Sir Henry Peek confer about the result of the latter's competition, and mention Robert Hunter. Grayshott Farm, May 1867. Mrs Gilchrist supervises the delivery of furniture for the Tennysons. William Allingham arrives unannounced. Haslemere High Street market, July 1867. Jane Hutchinson goes shopping with her eldest daughter Elsie, and has difficulty understanding the locals. Outside Haslemere Parish Church, 1868. Hodgson and Penfold congratulate Mr Etheridge on his becoming rector of the new parish of Haslemere. A room in London, 1868. George Shaw Lefevre welcomes Robert Hunter to his role as honorary solicitor to the Commons Preservation Society. A room in London, 1875. Octavia Hill and Edward Bond discuss the loss of the Swiss Cottage Fields. They ask Robert Hunter for help. ‘Inval,’ Haslemere, about 1882. Jonathan and Jane Hutchinson discuss their family, and the issues of building at Stoatley and elsewhere. Epping Forest, 6th May 1882. The Queen has declared Epping Forest open as a Public Park. Lefevre interests Hunter in a position within the Post Office. Tyndall's hut on Hindhead, March 1883. Louisa and John Tyndall are living happily in their one-room hut on Hindhead Common. Haslemere, July 1883. William Allingham collects signatures against an intended enclosure. He arrives at ‘Aldworth’ to add that of Tennyson. 'Meadfield', Haslemere, October 1883. The Hunters entertain the Fawcetts and the Allinghams to supper. A room in London, 1883. Rawnsley discusses with Percival Birkett yet another railway bill in the Lake District. They invite Hunter’s help. Lythe Hill House, August 1884. Mrs Hodgson is ‘at home’ to a number of local people, including the Tennysons, and the Allinghams. Swan Inn, Haslemere, 16th December 1884. Hodgson chairs the inaugural meeting of the Haslemere Commons Preservation Society. Birmingham and London, February 1885. Octavia Hill suggests a name for a new Company. Hunter makes his, now-famous, note: "? National Trust". Coombeswell, 1885. The Hutchinsons talk of the death of their youngest son. Hind Head House, March 1887. Tyndall talks to Sir Frederick Pollock - they discuss the encroachment on Tyndall's privacy of new buildings. Sandhills, 21st June 1887. The Allinghams return home after being at the Golden Jubilee celebrations in London. The Hindhead bonfire is ablaze. The Present day, inside the Happy Eater, Hindhead again. Our three men continue to chat. Scene changes back to Golden Jubilee night, June 1887. Inval, Haslemere, September 1887. Jane Hutchinson has died the previous month. Jonathan plans to start his Museum at Inval. A room in London, November 1889. Octavia Hill laments to Hunter that "Mr Shaw Lefevre does not rise to the idea of a new society." Aldworth, October 1891. The Tyndalls visit the Tennysons. The men share a pipe in the study and discuss old times and mutual interests. Dr Roger Hutchinson's house, Wednesday 5th October 1892. Tennyson is dying and Roger is called to Aldworth. Hind Head House, 4th December 1893. Louisa Tyndall has given John an accidental overdose of chloral. Jonathan Hutchinson arrives, but fears the worst. A room in London, November 1893. Octavia Hill, Rawnsley & Hunter meet before the decisive meeting to agree the formation of the National Trust. Haslemere High Street, July 1894. Hodgson, Penfold and the rector talk of local issues following the enforced sale of Hodgson’s Lythe Hill Estate. Workmen's Club, Haslemere, 8th December 1894. Sir Robert Hunter is proposed by the rector as Chairman of the new Haslemere Parish Council. Haslemere Museum, November 1895. Jonathan Hutchinson takes his 8 year old grandson Rex Chandler round the new museum, and gives him a test. Lea Park, Witley, May 1899. Whitaker Wright and Sir Frederick Pollock discuss the 'spoilation' of Hindhead caused by Wright's 'improvements' at Lea Park. A playing field near the ‘Royal Huts,’ Hindhead, September 1900. Arthur Conan Doyle joins in a game of football, and is interrupted by Flora Timms, the assistant postmistress at Grayshott. Haslemere Station, 16th March 1902. Hunter and Pollock discuss Whitaker Wright's arrest in America. Near the ‘Royal Huts,’ Hindhead, 1902. Sir Arthur Conan Doyle, recently knighted, arrives in Hindhead having driven his new car from Birmingham. A room in the Law Courts, The Strand, 26th January 1904. Whitaker Wright, having been sentenced to 7 years for fraud, takes his own life. Educational Hall, Haslemere, Saturday 14 Oct 1905. Hunter, Muir and Chubb meet, following a meeting of guarantors pledged to support the purchase of Hindhead Common at the forthcoming auction. Auction room at Godalming, 26th October 1905. Muir and Chubb bid for Hindhead Common. They do not quite make the price, but help is at hand! Epilogue. Sir Robert Hunter gives us a brief epilogue to his life.